"I don't know if you recall a website back in the day called Connexions - I have no idea whatever happened to it - but that's how we met," said Ryan. Back in the day was 2010, or when the two embarked on becoming a family. Ryan had been in a relationship for five years. Matt had been divorced for three years and having a series of one-off dates or short, six-month relationships with other gents. But, on August 31st the two met for their first date at an Italian restaurant in Ogden, Utah. About planning the first date, Ryan shared: "Matt always gives me a hard time, because he claims I was a little aloof." The two laughed. "I thought he was super hot," said Matt. "And during dinner we clicked really well. We found that we both like the outdoors, travel, adventure." "Now, years later I still remember how I knew there was something special off the bat, especially how open he was about everything, including having a daughter," Ryan added. When asked when things started getting serious, Ryan said: "After our first date, neither of us ever saw anyone again!" But, one could say the day Ryan met Matt's daughter, was the day they took a turn towards the long haul. 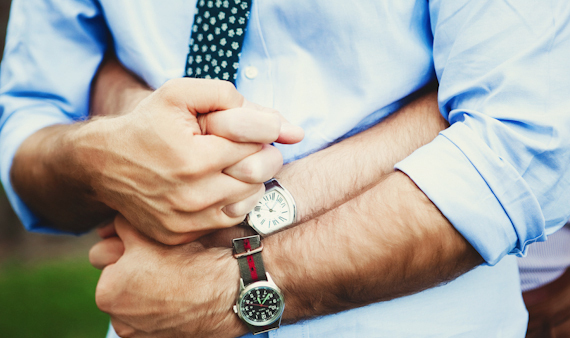 Engagement seems inevitable when couples start talking about the rings they like. And, it is a foregone conclusion when someone actually goes and buys them! Matt took the step of buying the rings and stashing them in a drawer for six months. "I knew he wasn't going to do it. He wanted me to," Matt said, laughing, and then asked Ryan: "Did you know I had bought them?" Ryan said yes, with a slight giggle. "I was engaged to be married before. When that fell apart, it took a lot of time for me to recover. But, in that time, I did realize that this person that I now have in my life has really helped me work through a lot of my last relationship, and feel what true and unconditional love is." Ryan said. 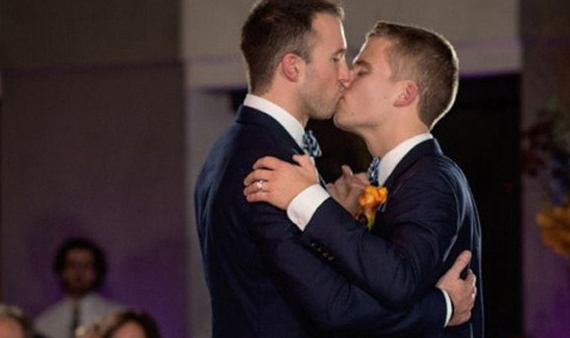 "When we finally got to that point, I was feeling like I could have also proposed. He just beat me to it!" "Neither of us had been to San Francisco" Matt said. "So for our five year anniversary of having met we decided to take a trip there and explore the city. It was such a fun trip! We saw so many iconic sites and had some really amazing food! " As for the "question popping," the two set out to walk across the Golden Gate Bridge. Matt pointed out: "he had no idea I had brought the rings with me and that I had them while we were on the bridge." So, while overlooking the majestic San Francisco Bay, Matt proposd. "He made me cry with a ton of Asian tourists around us!" Ryan said. When considering where to marry, their relationship with their family played a meaningful role. Ryan explained: "We both come from very religious families. My coming out to my family was really difficult and, while we are really close now - they even consider Matt's daughter their granddaughter - but the wedding would still be hard for some family members." So, deciding to get married further afield would make it easier on all involved. "We decided to get married in Kauai, doing what we do and going for the adventure of it," Ryan explained. Surprisingly, all of Matt's family decided to come, as did many from Ryan's! As for the planning, Matt said: "I did all of it!" Ryan confirmed when he said: "I pretty much checked out!" The two laughed, but also clarified. "We had a planner arrange all of the wedding, like getting permission to get married on the beach. But, everything to do with the houses and travel, Matt did it all." The couple arranged for their 20 guests to stay in homes they rented in Kauai and they even helped pay to make sure their guests could come and really enjoy the experience. 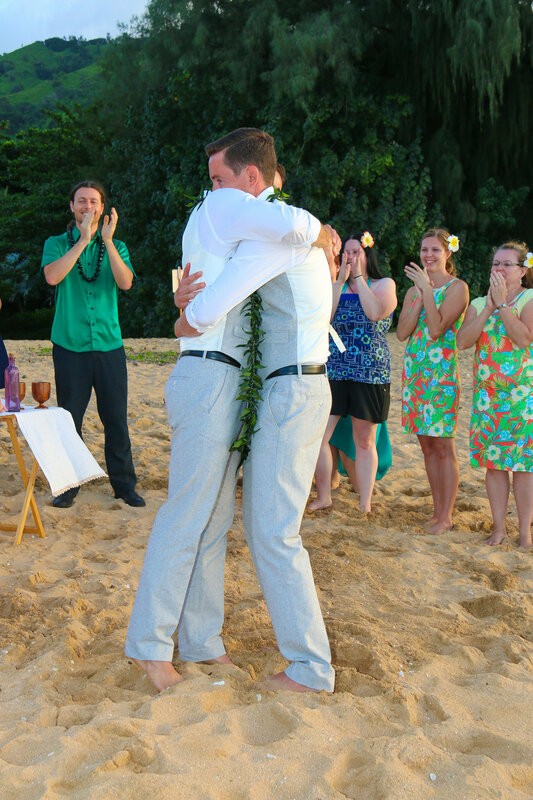 In October of last year, the sunset beach ceremony took place on Tunnels Beach. It was presided over by the husband-and-wife planners. "He was our officiant, she did all the photography!" Ryan shared and further described the ceremony: "We wrote our own vows. We wore traditional men's leis and our daughter wore her own lei and was a big pat of the ceremony. The sunset was beyond incredible and more than we could have imagined." 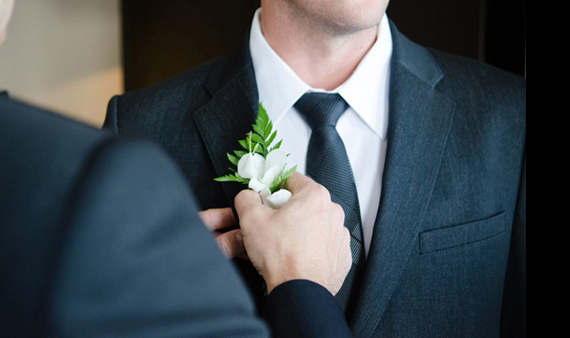 For Ryan, "the overwhelming feeling of being loved," was the happiest aspect of the wedding experience. This was a meaningful counterpoint to when Ryan, upon coming out, felt the opposite. Matt concurred that being literally and figuratively surrounded by love, was the best part of getting married. Next, "everybody partied" at a restaurant where friends and family celebrated the couple. "But, we were in Kauai for the week, so it wasn't just that night," Ryan continued. "We continued celebrating by showing everyone Kauai for a week." In essence, the wedding turned into a honeymoon. "Actually, the honeymoon was the following April on a two-week trip to Europe," Ryan explained. When asked what advice they'd give other couples, Ryan answered: "Just do what is in your heart." "Go with what feels best, whether a small backyard wedding or something big." Matt continued. More practically, Matt also stressed renting houses as a great way for people to have a more personal and, even, laid back experience. "We were all in a house together, so it felt like home, versus going back to some hotel room, where everyone else is apart." "The day after the wedding, still in Hawaii, our daughter brought us a crayon drawing," Ryan explained. It was a picture of Matt and Ryan. Above their heads read: "Dad and Dad." With that, a family was formed.